The Nikkei strength was the exception in Asia today, as all other core markets closed lower on the day. The Japanese index benefitted from the weakness of the Yen, which at one stage looked as though it may challenge the 111 handle. Even this evening in US trading it remains vulnerable as the safety bid appears to have weakened as cash moves towards stocks and away from bonds. The Hang Seng, Shanghai, KOPSI, ASX and SENSEX all closed around -0.5% lower, with many of the declines occurring in the final hour of trading. Currencies were also lower as the capital flow in the US Dollar continues to gain momentum, despite various official attempts to halt the flow. All markets are trying to calculate the effects of rising US treasury rates, as again today we have seen US 10’s trading towards the teens. In Europe, most were watching Italian stocks and debt after yesterdays fun and games. 10yr BTP’s did hit 2.18 yield in morning trading, but recovered just ahead of the close when rumours of a big buyer helped prices. Still closing 1bp higher at 2.12% it remains a cause for concern for both core and other peripheral markets. 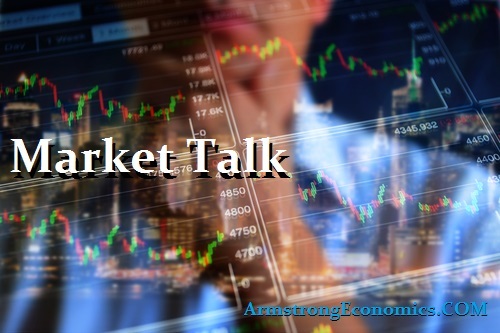 The talk in the street has been concerns over the lack of market depth when prices began to slide recently. As many banks are side-lined due to recent regulatory changes, most sellers are forced to wait for bids to appear or alternatively continue to offer paper at cheaper levels until a buyer appears. If this is the case now, when people have to sell it simply accelerates the speed of the decline and with virtually zero volume trading! Core European indices closed around 1% higher as money moves away from bonds. The Euro had another weak day but recovered from its worst levels as talk of support spread through the trading floors. The trend remains USD positive and the favoured equities over government bonds still the theme. All the fretting over 10yr treasuries trading 3.1% seems to have been overdone, as today it spent most of its time above there yet stocks performed ok! Trump certainly did not help matters when he expressed concerns over possible US/China trade tensions and that probably cost the DOW around 150 points. However, volumes and flow are light but there remains a considerable amount of money sitting in short-term instruments just waiting for a green light. The stock market still has to come to terms with rising rates being good for stocks. Japan 0.06%, US 2’s closed 2.57% (-2bp), 10’s 3.115% (+1.5bp), 30’s 3.25% (+3bp), Bunds 0.63% (+1bp), France 0.86% (+1bp), Italy 2.12% (+1bp), Greece 4.38% (+8bp), Turkey 14.39% (+28bp), Portugal 1.77% (-1bp), Spain 1.40% (u/c), and Gilts 1.56% (+6bp).